Available in a variety of sizes, these black gingham chef trousers remain a firm favourite with professional and trainee chefs. 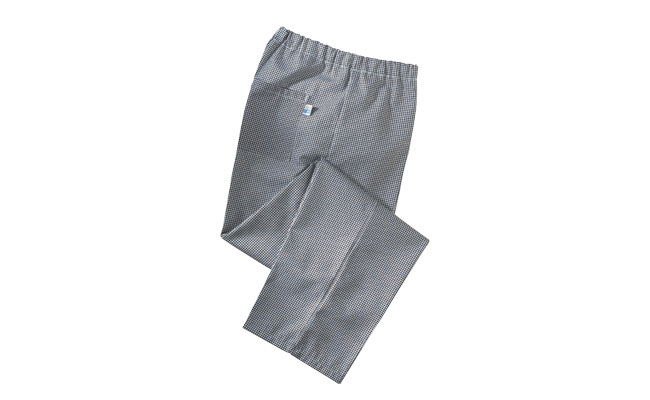 These chef trousers have a traditional pattern and are made from a combination of polyester and cotton. For ultimate comfort in a hot, busy commercial kitchen, these trousers have an elasticated waist for comfort and one patch pocket on the rear to pop your essential items in. The baggy fit, relaxed waist and polycotton material of this chef trouser is the perfect combination for chefs who long for comfort in the heated environment of the kitchen. As a baggy trouser, air is free to circulate around the legs, which help you keep cool and the elastic waist ensures that these chef trousers won’t dig into your hips. Buy your black gingham chef trousers from an extensive range of chef trousers available to buy from Pattersons Catering Supplies. Our chef trousers are part of a large range of chef clothing available to order now. If you have any questions about the range of chef trousers or chef clothing we stock here at Pattersons Catering Supplies, please contact our catering product experts on 0117 934 1270, or email us on web@pattersons.co.uk.